Lightning is the discharge of accumulated electrical charges between a cloud and the ground, between two clouds or even between two opposite charged areas of the same cloud. It appears when electrified clouds develop and it serves as their discharging mechanism. The lightning is accompanied by a mechanical disturbance of the air around it called thunder. 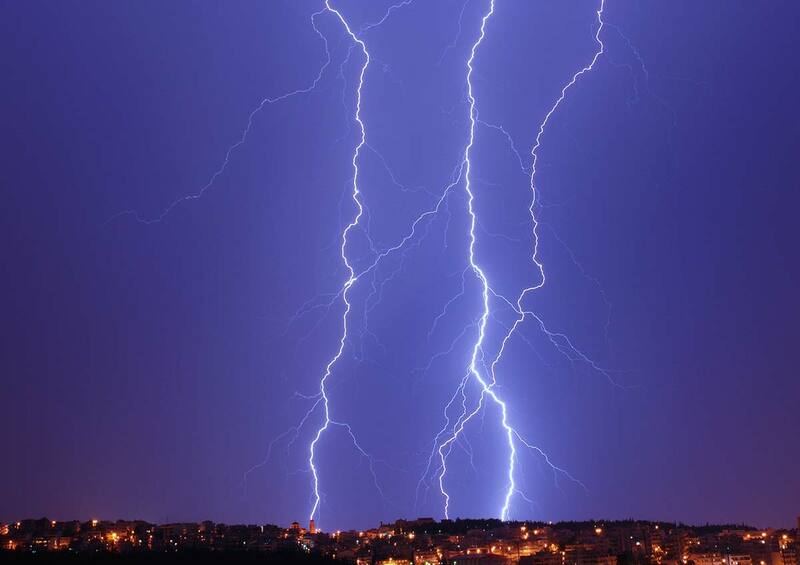 Depending on the two endpoints of the lightning we can divide lightning in 3 main groups. The Cloud-to-Ground (CG) discharges where the lighting connects a charged area of a cloud with the ground, the Cloud-to-Cloud (CC) discharges where the lightning connects charged areas of two different clouds and the Intra-Cloud (IC) discharges where the lightning connects two charged areas of the same cloud. During a thunderstorm free day, the earth surface is negatively charged. When a Cb cloud is formed this status changes. Inside the developing cloud strong updrafts exists in its core that transfer small ice particles towards the higher levels of the cloud. Around the freezing level (0oC) these particles collide with the dropping hail pellets that are too heavy to be uplifted. These collisions result in the positive charging of the ice particles and the negative charging of hail pellets. Soon the upper level of the cloud is dominated by positive charges and the lower by negative. The presence of negative charges so close to the ground push away the negative charges of the earth surface and creates a significant potential difference that can be tens of thousands of Volts. Normally, the atmospheric air acts as an insulator. However, just like all insulators, when a critical potential difference is reach, the insulator breaks down and charges flow to even the difference. This flow of charges through our atmosphere is the lightning. The amount of energy that is released with the lightning is so much that warms up the air around it by several thousand degrees Celsius! But what exactly is lightning? Is it a simple instant spark? Fortunately No! Lightning is a sequence of marvelous, spectacular events that are usually perceived as a single event due to their very short duration.The most straight-forward mechanism of CG lightning consists of at least one leader and at least one return stroke. The leader sets up the channel through which the return stroke will release the main amount of charge. It actually makes the connection between the two opposite charged areas and creates the road for the charges to flow. There are many types of leaders and the most common member of the family is the stepped leader. The stepped leader moves in steps through a lot of branches towards the ground in order to establish connection. As soon as one branch succeeds, all accumulated charges are freed to move and the rapid flow of electricity creates the very bright return stroke which is what we usually observe.